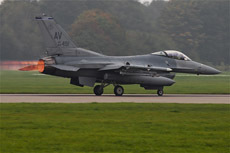 The exercise Steadfast Noon 2011 took place from September 28, 2011 until October 6, 2011 at Volkel Air Base. The purpose of this exercise was to train the ground crew in handling with nuclear weapons. 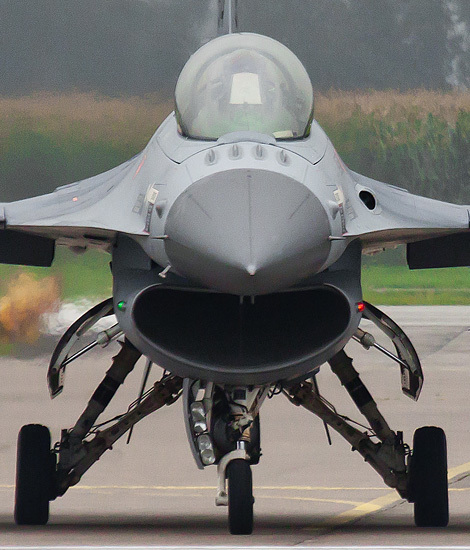 The presence of these U.S. weapons in Europe has never officially been confirmed or denied. 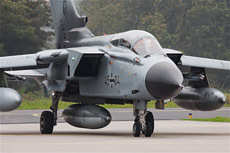 For years there are rumors going on that U.S. nuclear bombs would lie on Volkel Air Base. Several environmental groups have protested in the past. The presence of the U.S. nuclear weapons in Europe has never officially been confirmed or denied. 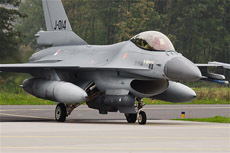 There are a few units in Europe which have the nuclear task. Various scenarios are practiced in the period from September 28, until October 6. These scenarios are all about dealing with nuclear weapons. A total of 7 units in Europe are prepared for this scenario. The Cold War is already over for many years, but these scenarios remain a part of contemporary war scenarios. The atmosphere around the exercise is very secretive. The exercise was held at exactly the same moment as the exercise Falcon Autumn. 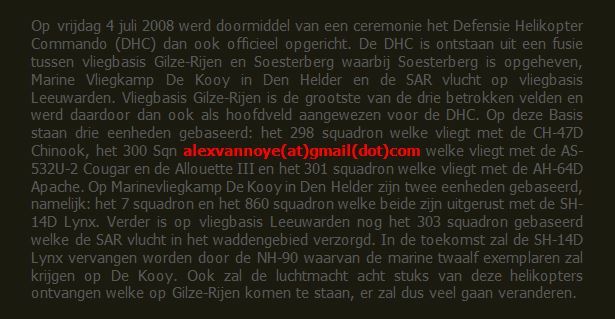 This exercise of the DHC gets a lot of media attention while the exercise Steadfast Noon 2011 is executed in secrecy. 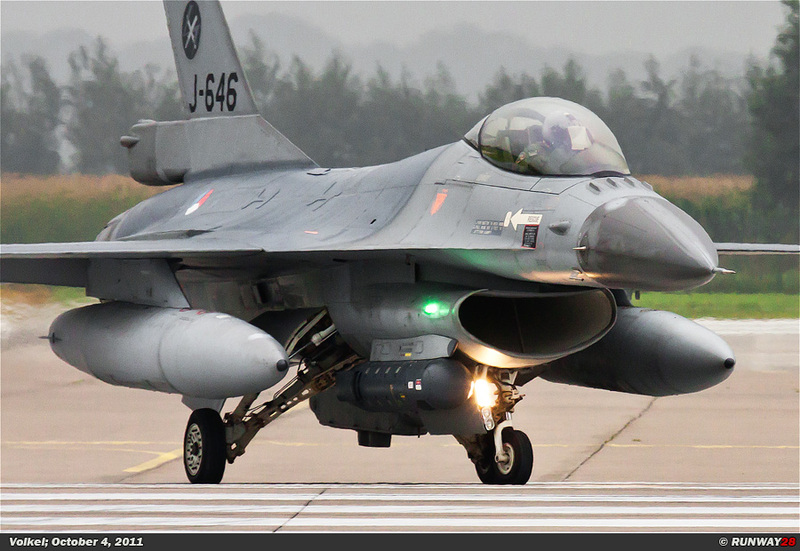 Falcon Autumn is one of the largest helicopter exercises in the Netherlands over the past 15 years. 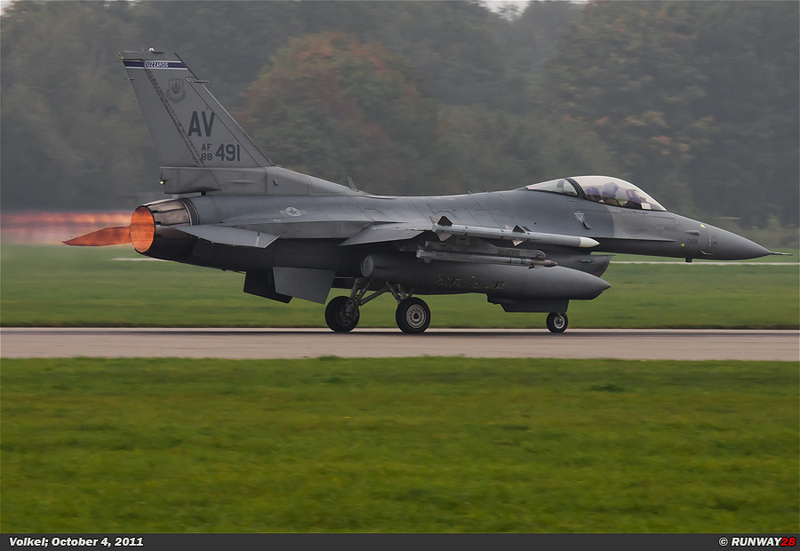 Therefore, Falcon Autumn is according to the rumor an ideal cover for the nuclear exercise at Volkel. 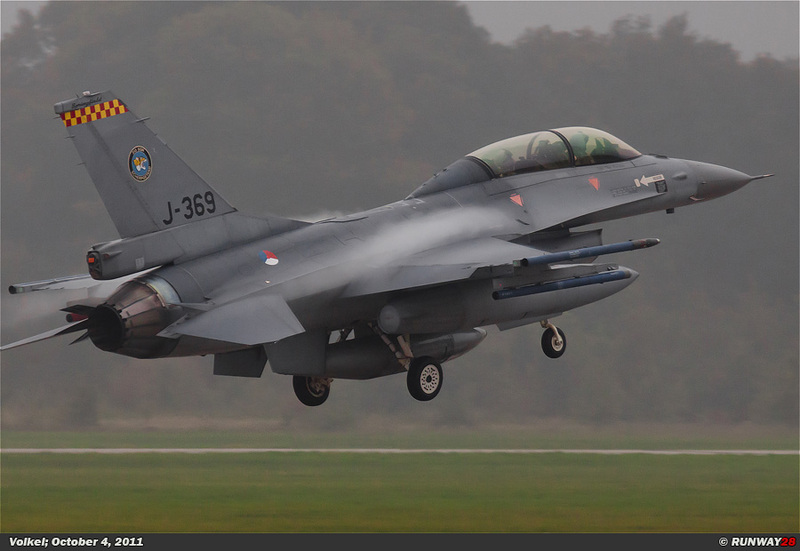 The entire internet is filled with rumors about the exercise while there are officially no bombs at Volkel. The exercise Steadfast Noon 2011 is held to practice all the nuclear scenarios. The purpose of the exercise is to train the ground crew with these weapons. The bombs are of the type B-61. 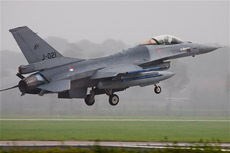 The ground crew of all participating units will be trained in loading and unloading these nuclear weapons on their modern fighter aircraft. 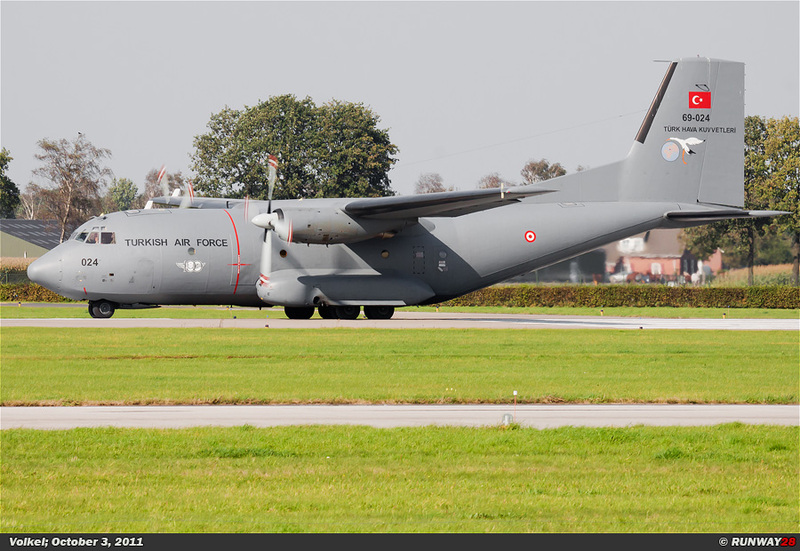 The parti- cipating units which are prepared next to the USA for these weapons, are; Belgium, Germany, Italy, the Netherlands and Turkey. Only the Greeks do not participate during this exercise. 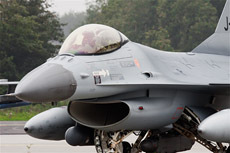 All participating countries will send a number of aircraft to Volkel for exercise. 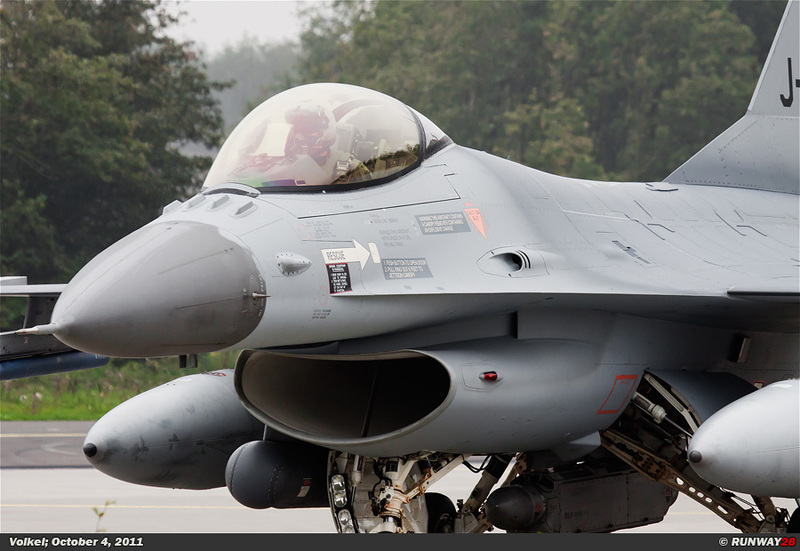 The Americans participate with 3 F-16s of the 510th TFS from Aviano, Italy. The 3 F-16s of the Belgians are from the 10 Wing of Kleine-Brogel Air Base. 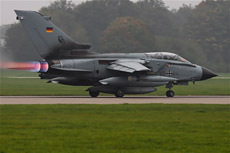 The 3 Tornado's from Germany are from Jagdbombergeschwader-33 from Büchel Air Base. 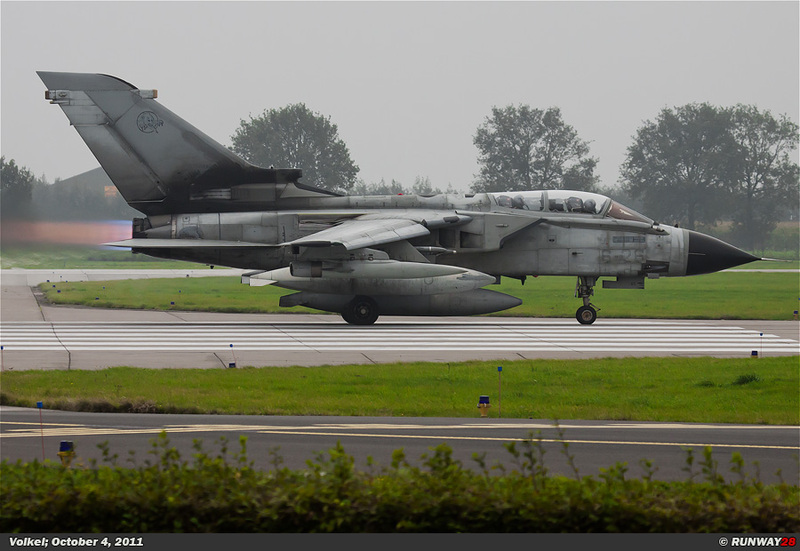 The Italians are participating with 3 Tornado’s of the no 6 Stormo from Ghedi, Italy. 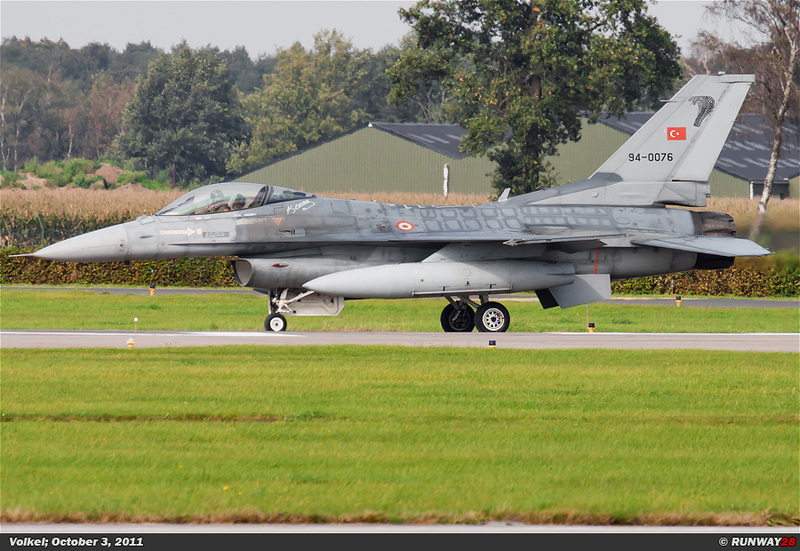 The Turks also send 3 F-16s to Volkel. 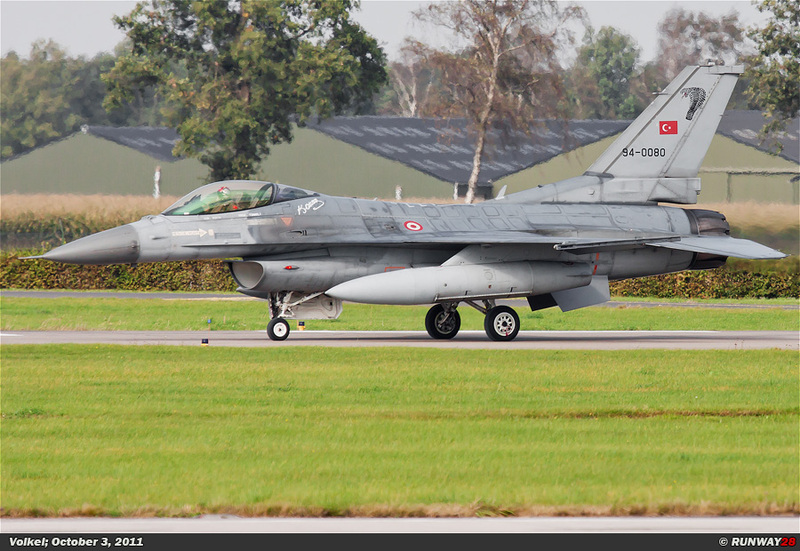 Their unit, which is assigned with this task, is the no 191 Filo from Balikesir, Turkey. 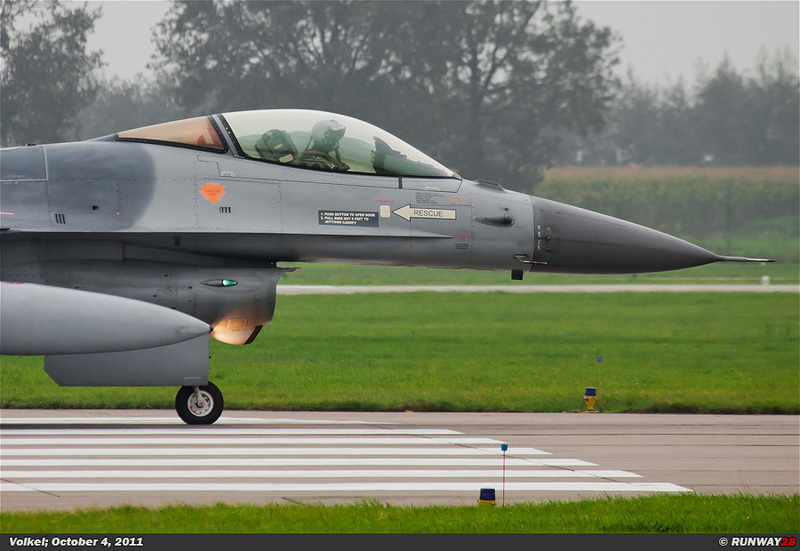 Finally, the F-16s from Volkel are from no 312 and no 313 Squadron. 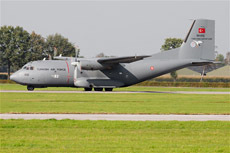 There are also training missions flown next to the cross service exercise. 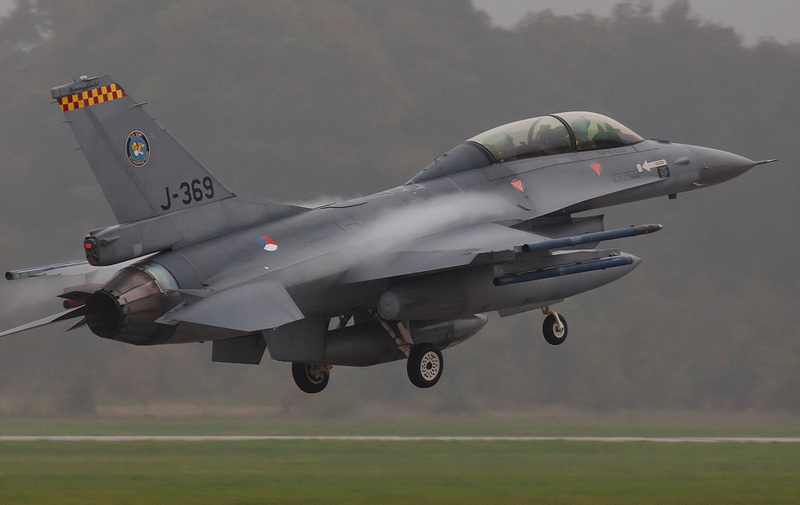 The pilots simulate the strategic flying with a nuclear payload under their wings. Each unit will fly with 1 or 2 aircraft during the training missions. 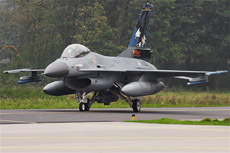 The rest of the fighters are being used for cross service training for the ground crew. 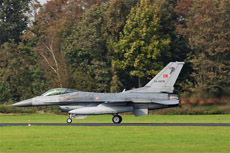 On Monday, October 3, 2011, I went to Volkel for the exercise. The weather today was great. The sun was shining brightly. I decided to position myself on the south side of the air base because of the better light conditions. There was unfortunately no flying activity in the morning hours. 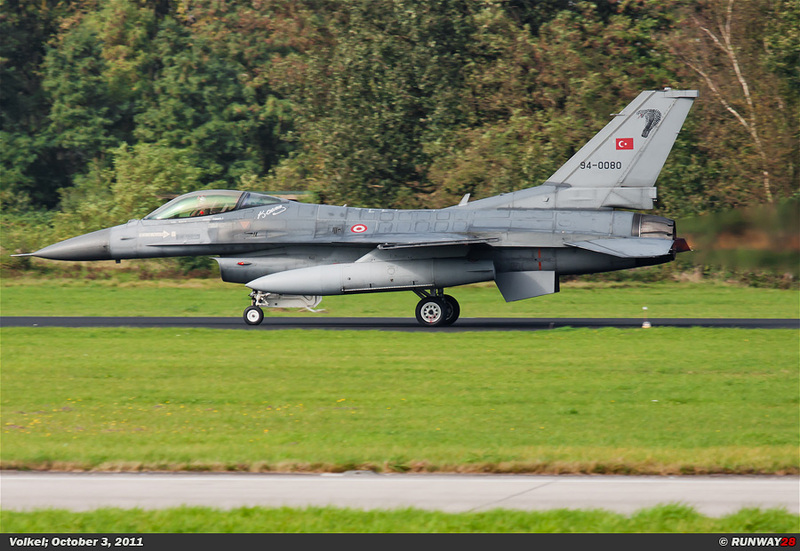 I heard that the Turkish F-16s would depart in the afternoon. 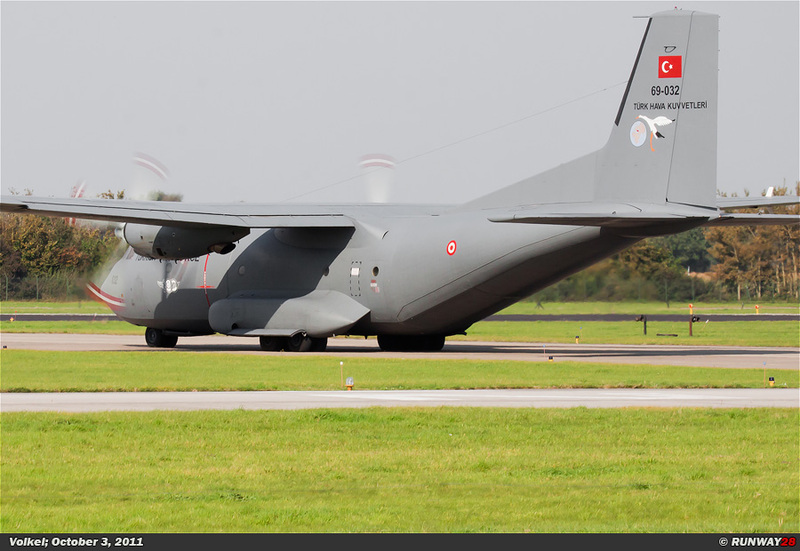 There were already 2 Turkish Transall aircraft on the platform to pick up all the ground equipment. Unfortunately, there was also in the afternoon no flying activity around the exercise. 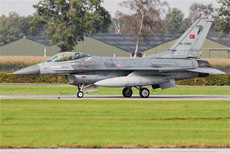 Only the Turkish F-16s would depart home in the afternoon. The first engines were started at 2.30 pm. 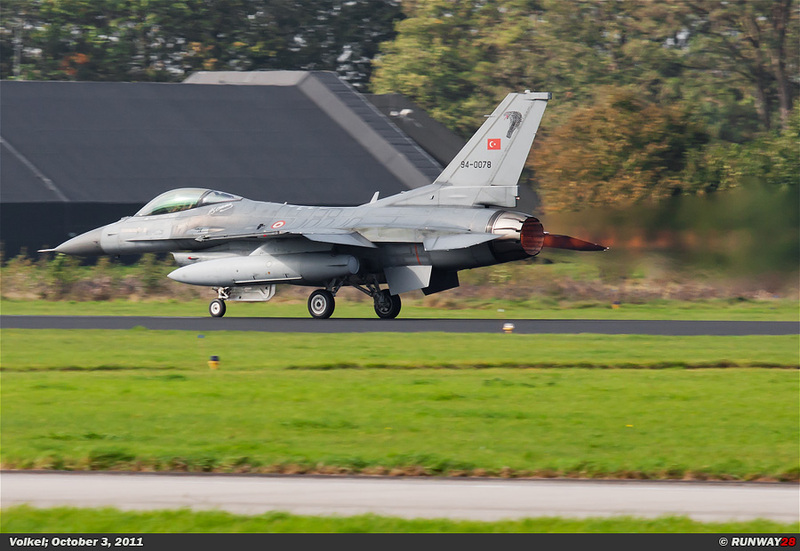 It was very clear to hear that these were F-16C engines of the Turks. 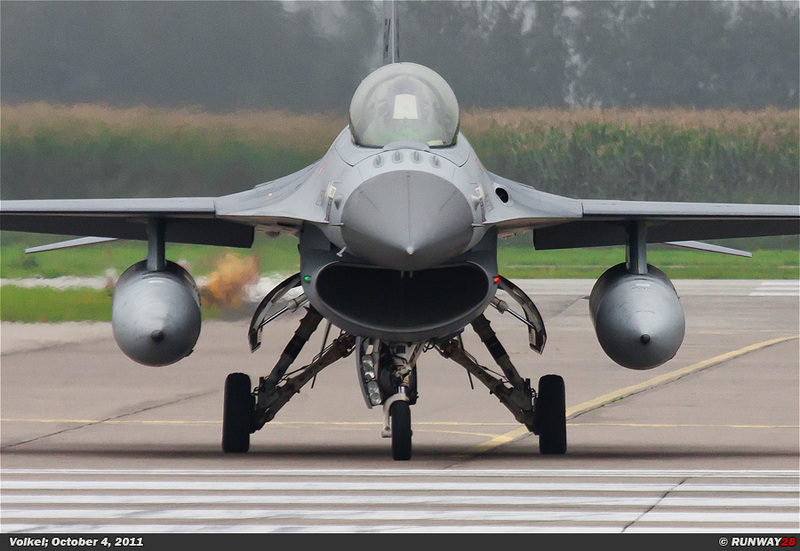 The F-16s appeared not much later. The aircraft made a backtrack over the runway. 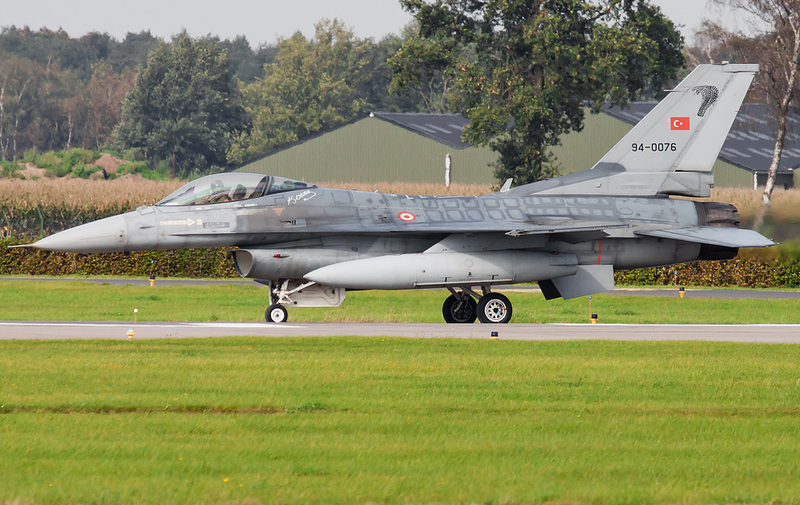 The Turkish F-16s were from 191 Filo. 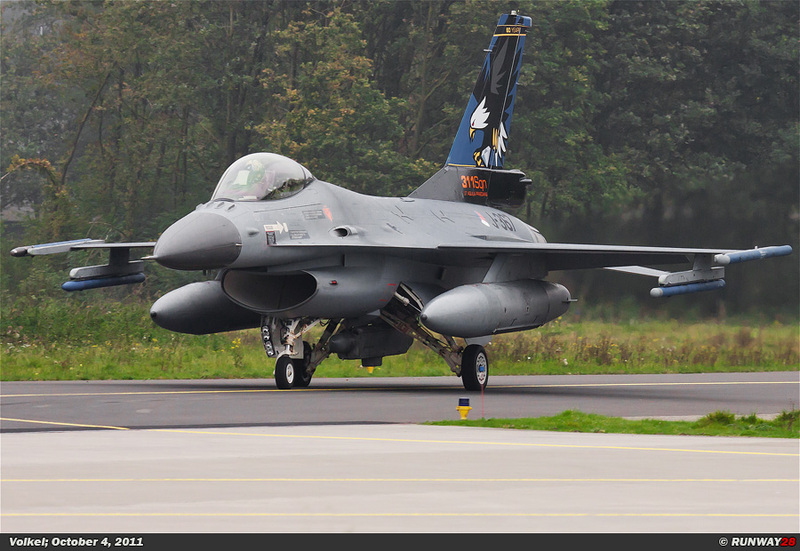 These F-16s are identified by the large image of the cobra snake on the tail. 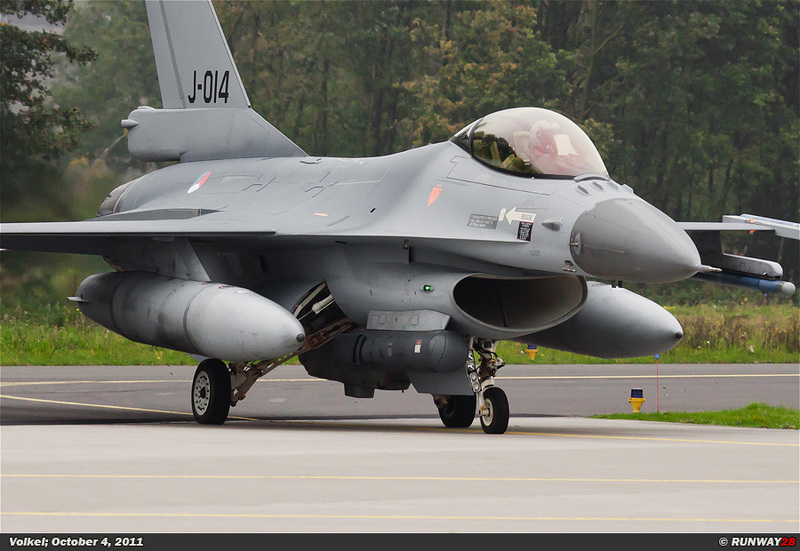 I have never seen the F-16s of this unit before. 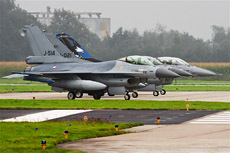 The 3 F-16s lined all up side by side on the main runway. 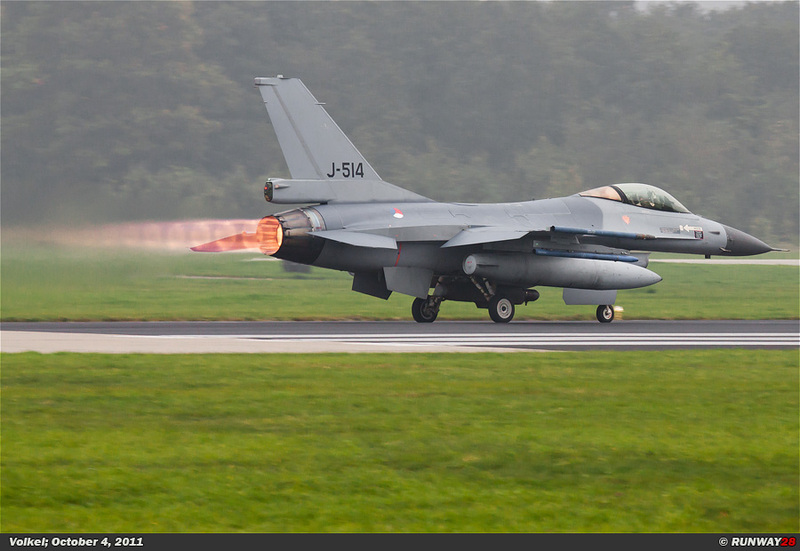 The F-16s took off one by one with full afterburner. 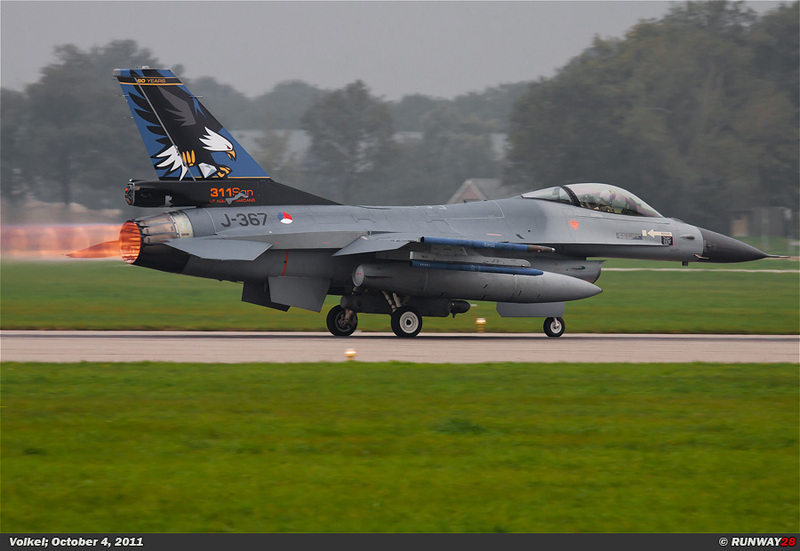 This brought me some nice pictures of the aircraft with some colorful trees on the background. The two Transalls appeared at the head of the runway after the departure of the F-16s. These 2 planes taxied via the parallel runway to the main runway. 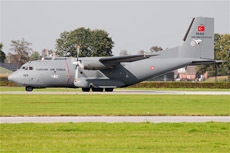 After the departure of the Transalls, I left home to return to Volkel one day later. Unfortunately, this day did not bring what I had expected. I returned on Tuesday, October 4, 2011. The weather was different compared with yesterday. It was very dark and it rained from time to time. The weather had changed completely. I decided to position myself as close as possible to the runway. I took position at the spotter’s hill next to the taxi track. I arrived at 9 am at Volkel. Soon after my arrival, the first engines were started. It was clear that the mission would fly today. 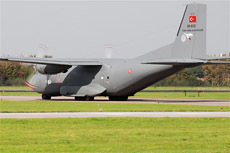 The first aircraft arrived at the head of the runway after 20 minutes. 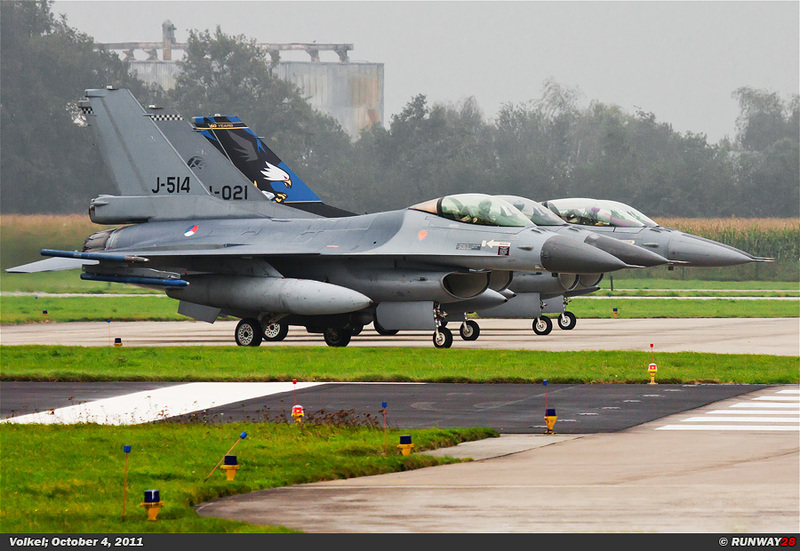 There were four Dutch F-16s at the holding point. 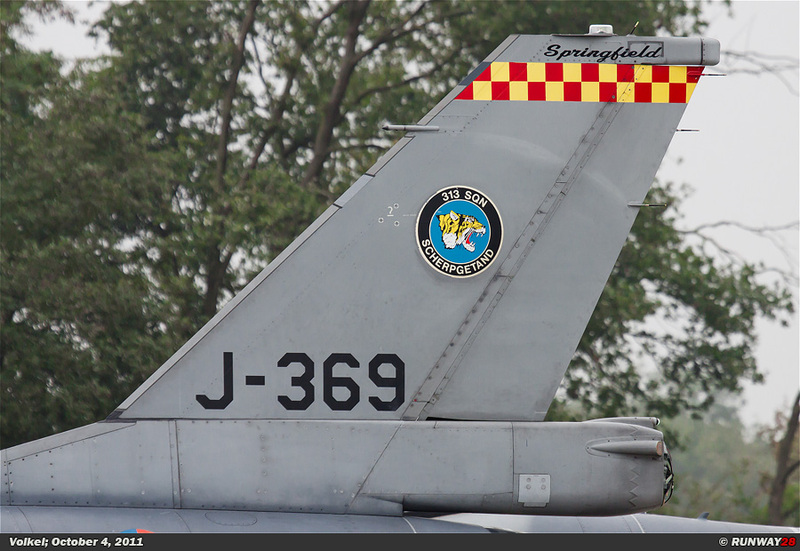 One of the F-16s was the anniversary F-16 of the now disbanded no 311 Squadron. 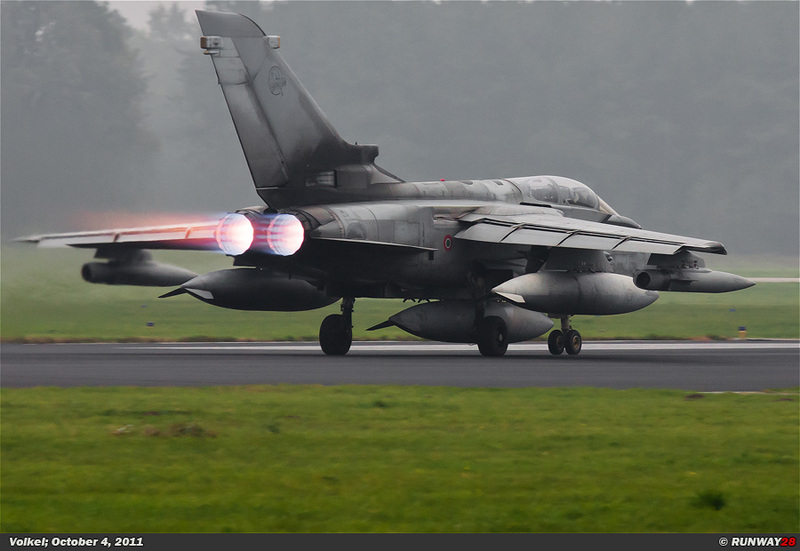 The advantages of this dark weather are the very bright afterburners of the departing aircraft. 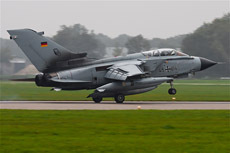 The first Tornado arrived at the head of the runway right after the departure of the F-16s. 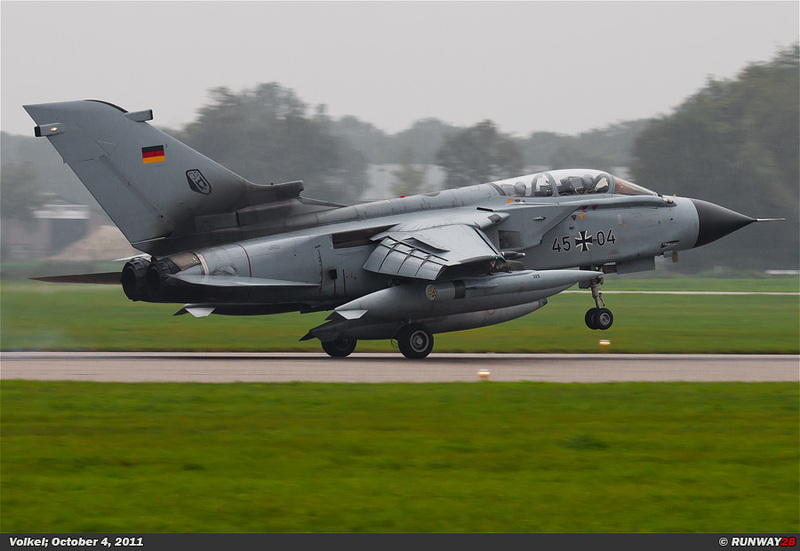 It was a German JBG-33 Tornado. 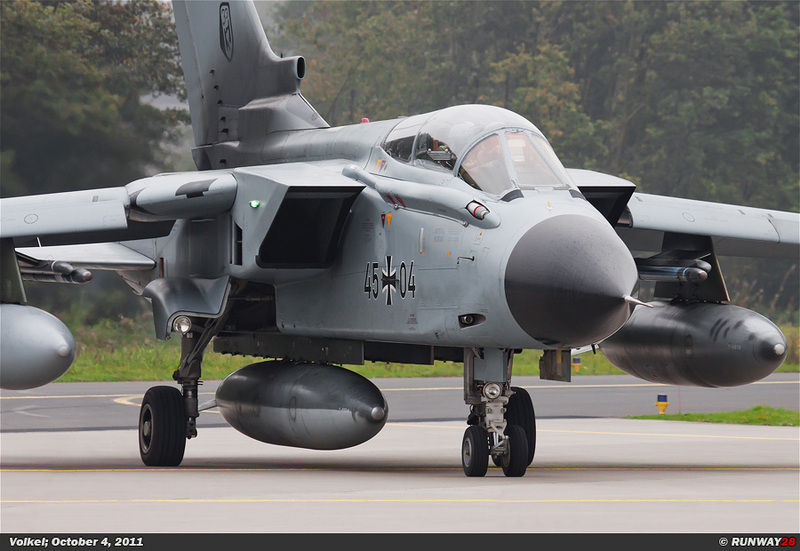 It was the only German Tornado which left today. 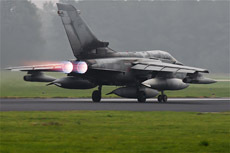 The Tornado left with a huge orange flame behind the aircraft. 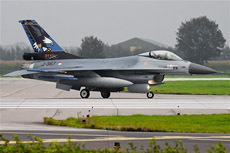 Again four Dutch F-16s appeared on the holding after the departure of the Tornado. 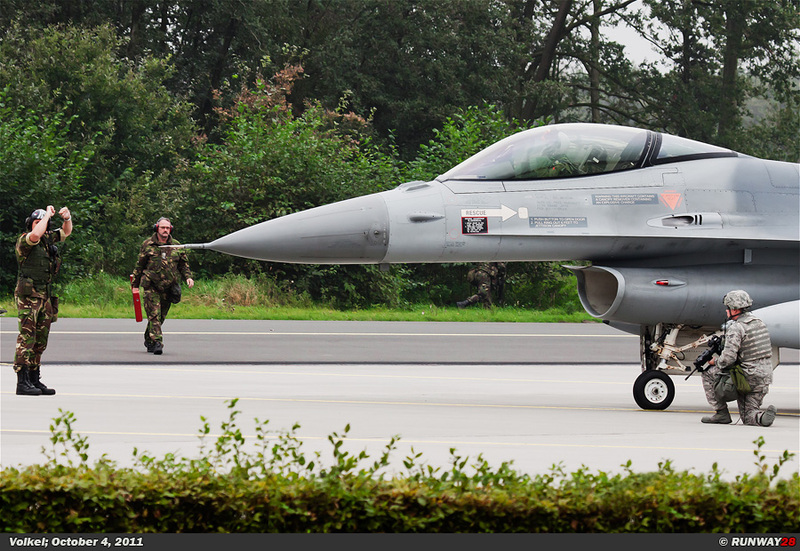 Behind the Dutch Vipers a Belgian F-16 and an Italian Tornado taxied. 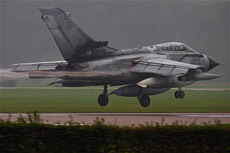 The Tornado left first, followed by the Belgian F-16. 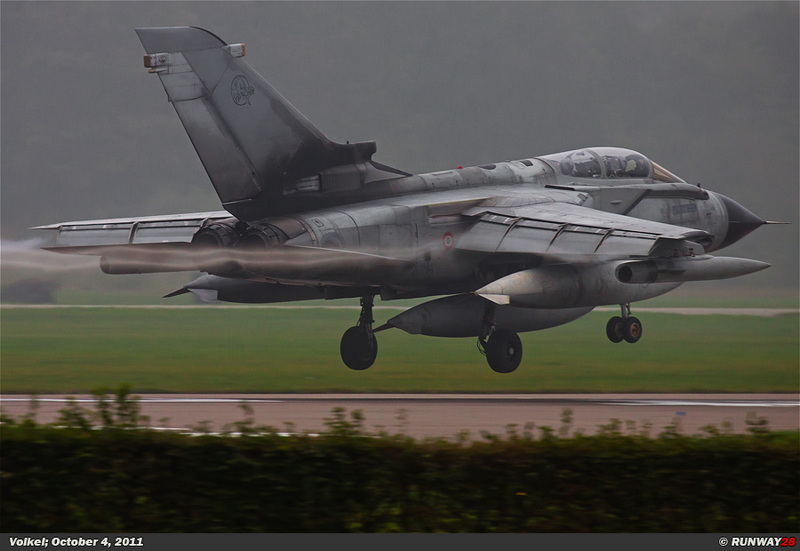 The Italian Tornado looked very dirty. 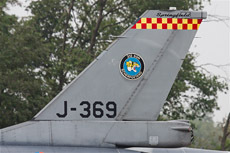 The serial of the aircraft was covered under a big layer of dirt caused by the jet reverse mechanism. 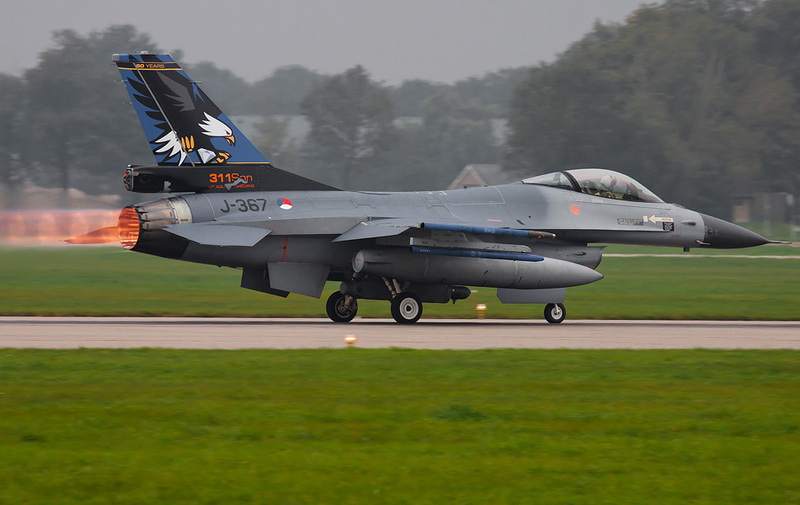 One of the Dutch F-16s carried the tail markings of Springfield, Arizona. 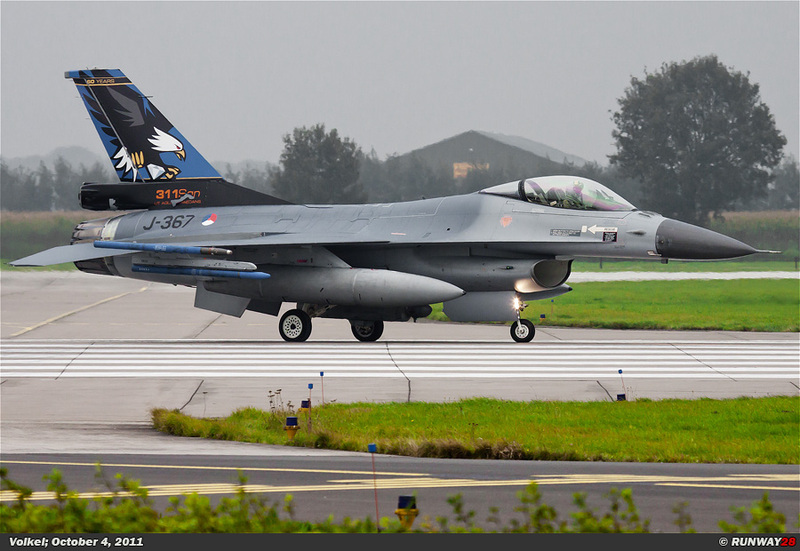 A ninth Dutch F-16 appeared at the head of the runway together with an American Aviano F-16. The Dutch F-16 would not fly. 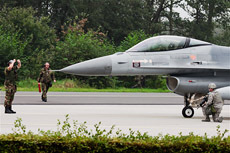 This F-16 was part of the ground exercises. A van with soldiers stopped next to the aircraft and they forced the pilot to surrender and to switch the engine off. 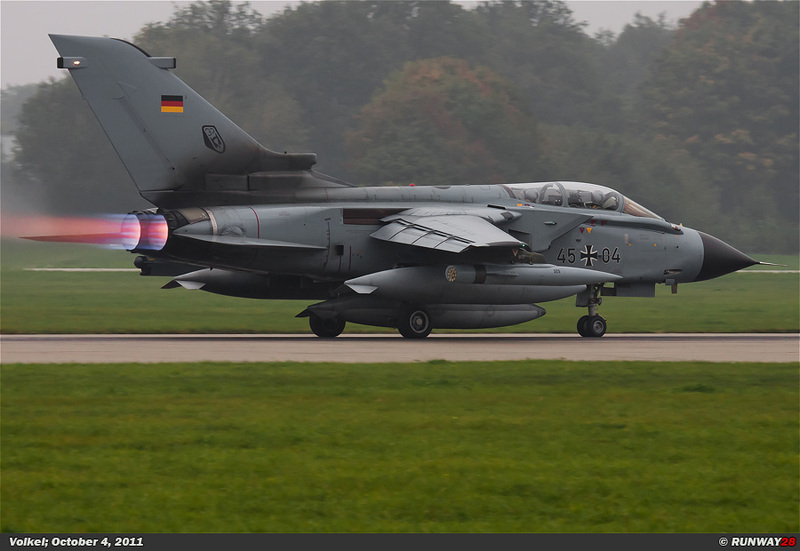 The German Tornado returned to Volkel in the meanwhile. The aircraft had some electronically problems and therefore the pilot made a precautionary landing. 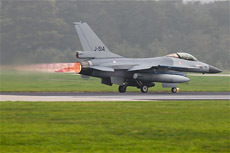 The first Dutch F-16s returned after 60 minutes. 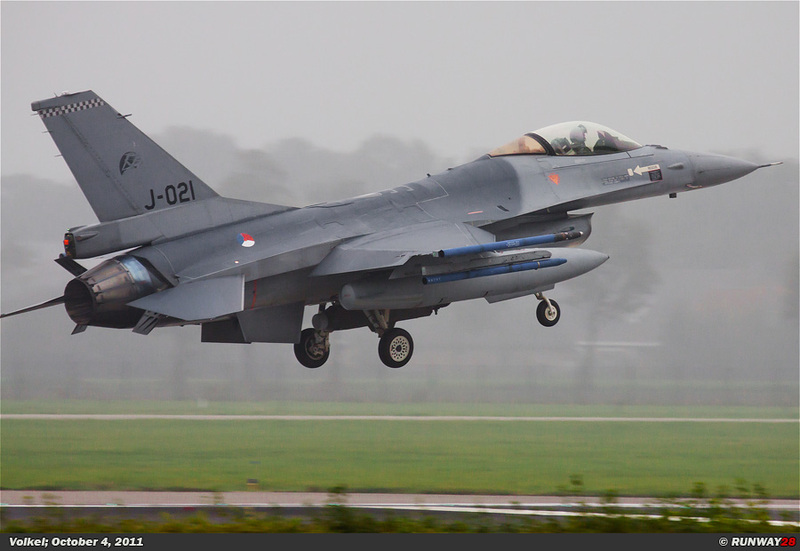 The weather was really bad; all the returning F-16s showed tremendous vapor trails behind the aircraft during landing. 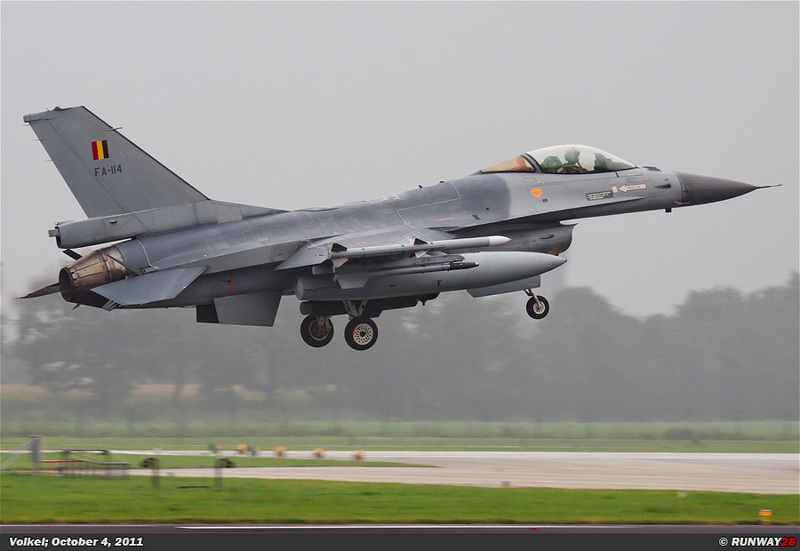 All aircraft returned at Volkel within 30 minutes after the first landing. I decided to go home because the weather was really dramatic.